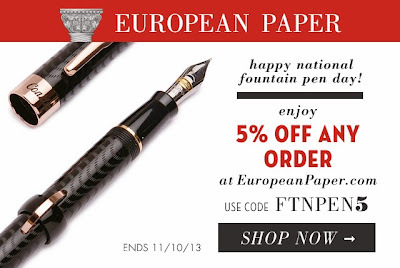 Built from Ink and Tea: Fountain Pen Day Special Offer! For all of the wonderful readers of this blog (and any who may have just started reading), I bring you this great offer from European Paper! Click on the picture, below, to be taken to European Paper's site and use the code mentioned, when checking out, for 5% off your order.